There has been some controversy in recent years regarding whether or not greyhounds bleed and to what extent during surgery or post-surgery. I believe National Greyhound Adoption Program is qualified to answer that in resounding terms based on our fifteen years of in-house surgical operation on greyhounds. Although I myself am not a veterinarian, I am responsible for the care of the greyhounds in our kennel 365 days a year. Our kennel capacity is approximately 100 with an average of 70 at all times. I routinely work with our in-house veterinarians in surgery and am made aware of surgical problems as they come up. We always do whatever is necessary to eliminate those problems. Bleeding has never been one of those problems in which we had to alter or change any of our protocols to mitigate that problem. 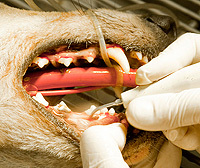 NGAP excels at dentistry and we perform more dentals and extractions on greyhounds than anywhere in the United States and possibly even the world. 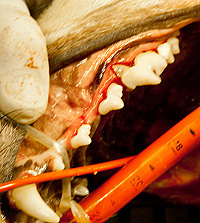 It is common for us to do 10-20 extractions per week on multiple dogs. It is rare to have any postoperative bleeding, in fact it would be the exception to the rule. Facial swelling is more common and that is seen in about 5% of extraction cases. We perform approximately 2000 dentals under anesthesia protocol each year - probably 60% of those using Domitor/Turbalgesic/Anteseden administered at 0.5ml/0.2ml/0.5ml respectively. This combination is also sometimes used to induce intubation when needed. We have also used this anesthesia protocol for major surgeries including leg amputations. We have noted that Galgos, when induced with Domitor, have a slower recovery time and appear to be groggy for several hours. 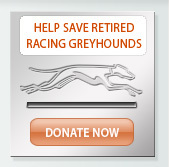 We have not seen this in greyhounds. I cannot tell you precisely how many spays and neuters we have done in-house, but we have done over 7000 greyhound adoptions and the vast majority of those dogs were altered at our facility. I can only recall three dogs that did not survive the surgery due to bleeding issues. On average, we may have one female spay with post-op bleeding per year. Because we are able to determine signs of deterioration due to that bleeding, additional surgery is performed and the greyhound survives. As a rule for neuters, spays, eye, tail, toe and growth removals, and leg amputations, we rarely have any degree of bleeding. We do about two leg amputations a year. Before a leg amputation, we do not transfuse and have never had to transfuse a post-op leg amputation. We may need to transfuse a greyhound once or twice a year but generally that is done on greyhounds that comes to our clinic with an illness, not for post-op bleeding. Most vets that I have known for many years do not have difficulties with bleeding greyhounds. One anomaly to our experience is that, out of 500 greyhounds tested for Von Willebrand’s in 2001, 76% of greyhounds tested positive and 38% were identified as carriers. NGAP uses a test called the Boccul Mucosa Bleeding Test to determine if we will cut females for spay. A test instrument is used to prick the gum lining and the bleeding is timed to see how long it takes to coagulate. We have found that test to be very reliable. If the time is under five minutes, we proceed with the surgery. If the time is over five minutes, we wait about a month and try again. In my view, the easiest test to determine if a greyhound has bleeding issues is to draw blood and then simply place your finger over the needle puncture for a moment. If no blood comes out, you are usually fine. If you have blood coming out willy-nilly you know you will have to be more careful with that greyhound regarding bleeding issues. If the dog bleeds and then you send that same dog’s blood off for a Von Willebrand’s test, I can assure you it will come back positive. 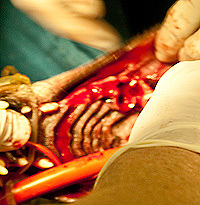 It is the view of this writer, that greyhounds that bleed either during or immediately after surgery have a direct relationship with the condition of the dog prior to surgery, the anesthesia protocol and procedures performed during the surgery, and most importantly, the skill of the veterinarian doing the surgery. 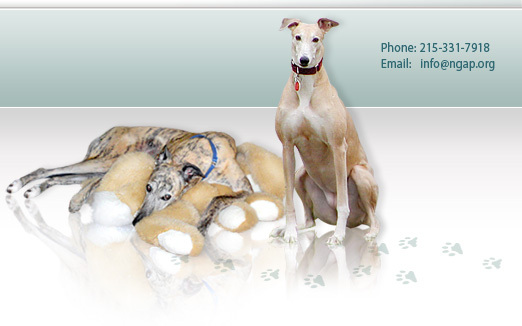 In January of 2006, Dr. Couto presented a lecture at the North American Veterinary Conference referencing the various bleeding problems that greyhounds have. 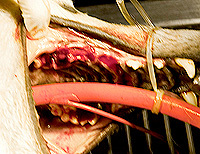 He stated that 26% of greyhounds have post-operative bleeding. In the view of this writer, greyhounds that bleed, either during or after surgery, have a direct relationship with the condition of the dog prior to surgery, the anesthesia protocol, procedures performed during surgery, and most importantly, the skill of the veterinary surgeon. After listening to his lecture and viewing the slides presented, it was my opinion that the problems that were being encountered at Ohio State University were based on in-house issues, as opposed to breed issues. I was told that the dogs that were photographed had just come in after a long trip and they certainly would have been stressed by that trip. 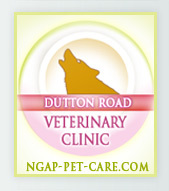 Normally, at NGAP, we hold the dogs for a minimum of one week, if not longer, before any surgical procedures are done. This allows the greyhounds to settle down, get cleaned up, and wormed, and ensures us that each dog’s overall health is good. Each greyhound is given a boccul mucosa test prior to surgery. Dogs pictured at the presentation showing excessive bleeding had incisions that appeared to be as long as seven inches in length. 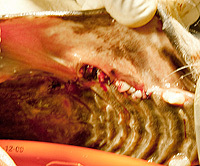 The procedures were being done by third year vet students as opposed to skilled and experienced veterinarians. Generally, our incisions are approximately two inches in length. In that lecture, Dr. Couto also related that either most, or all, of the greyhounds that need leg amputations would be transfused prior to and after the surgeries. We have never found that to be necessary. There were several photographs from an OSU surgery showing an towels soaked extensively with bloods and considerable hematomas due to internal bleeding. We just do not encounter that here. Top Photo: Right side of dog the morning after surgery. Top Photo: Left side of dog the morning after surgery. The purpose of these dental photographs is to show that although there is some bleeding during extractions, it is easily controlled and post-op shows no external bleeding the day after. The photos shown are specifically of dental extractions, the cavities associated with those extractions, the procedures used to mitigate bleeding at the time of surgery and two post-operative pictures the day after surgery. Over the last fifteen years, we have done non-dental surgeries and other surgical procedures on at least 10,000 greyhounds. Three of them have died. Approximately twenty may have had post-operative hematomas and discoloration. That comes to .002%. I have now heard Dr. Couto's lecture on three separate occasions and after each lecture have disputed his findings. Why is it that with all of the surgery that we do at NGAP and all of the surgeries taking place at other places, do greyhounds not bleed, but so many are bleeding at OSU? It is the belief of this writer that maybe Ohio State University should take a better look at procedures performed at other veterinary facilities to see why they have such a high incidence of bleeding. I never realized until this conference that we were so much better! We invite anyone qualified to come and observe our doctors in surgery. Over the next few weeks, we will add photographs that will probably be boring in nature to most, showing incisions at the time of surgery, after surgery and 36 hours after surgery to show evidence that our greyhounds don't bleed. Stay tuned!